Lausanne (SUI), 17 March 2016 – Tokyo, host city for the 2020 Olympic Games, has given the best possible endorsement for equestrian sport by inviting the Fédération Equestre Internationale (FEI) to hold its General Assembly in the Japanese capital in November 2016. The allocation of the 2016 FEI General Assembly to Tokyo was approved by the FEI Bureau during its monthly teleconference this week. The FEI Bureau also allocated the 2017 General Assembly to Montevideo (URU). “It’s an honour to have Olympic city Tokyo as our hosts for the 2016 FEI General Assembly,” FEI President Ingmar De Vos said. “We are already looking forward to being in Japan for the 2020 Olympic Games and it couldn’t be more appropriate to be going to Tokyo as our National Federations will be voting on changes to our discipline formats for the 2020 Games at this year’s General Assembly. “It is a great honour to be appointed as the host National Federation of the FEI General Assembly 2016 here in Tokyo. As we continue preparations for the Tokyo 2020 Olympic Games, hosting the General Assembly here is extremely important for us. We will welcome our FEI equestrian family in true hospitable Japanese tradition – we are really looking forward to seeing everyone in Tokyo,” said Japan Equestrian Federation President Genshitsu Sen. The 2016 General Assembly will be held in Tokyo from 18-22 November. Dates for the 2017 General Assembly in Montevideo are still to be confirmed. FEI General Assembly 2015 in full session on 13 November 2015 in San Juan, Puerto Rico (PUR). FEI/Richard Juilliart. San Juan (PUR), 13 November 2015 – The final day of the FEI General Assembly 2015 took place in San Juan (PUR) today, and FEI President Ingmar De Vos opened the day’s proceedings with thanks to the Puerto Rican Equestrian Federation, its President Rosana Roig and her team for the wonderful welcome. This is the second time that the FEI General Assembly has been in Puerto Rico, which previously hosted the annual meeting 18 years ago. During the all-day meeting, member National Federations voted on a wide range of topics, which are detailed here. A total of 100 of the 134 member National Federations were represented, 75 in person and 25 by proxy. Rodrigo Garcia, Rio 2016 Sports Director, gave delegates an update on developments at the Deodoro Olympic Park, the second largest Rio 2016 Games cluster, and home to the Olympic and Paralympic Equestrian Centre. Details included the proximity of the Equestrian Centre to the other sports at Deodoro, Games-time accommodation including the Athletes’ Village, the competition schedule and the success of the Test Event. Martin Atock of Peden Bloodstock then updated National Federations on biosecurity measures in Rio and the equestrian freight manual. Delegates were also given the latest information on progress with the FEI World Equestrian Games™ 2018 in Bromont/Montreal (CAN), and heard a presentation from Roly Owers, Chief Executive of the equine charity World Horse Welfare, the FEI’s welfare advisor for more than 30 years. Once business had been concluded, the FEI President welcomed two new member Federations into the FEI Family by presenting the FEI flag to Angola and Bosnia & Herzegovina. The President also made a special presentation to outgoing Chair of the Vaulting Committee, Emma Seely (USA), in recognition of her dedication to the discipline during her eight-year term in office. Sergey Buikevich (KAZ), outgoing Chair of FEI Regional Group III, was also honoured for his eight years on the FEI Bureau. FEI Badges of Honour for National Federation representatives that have attended 15 or more FEI General Assemblies were then presented to six individuals by the FEI President. Recipients of FEI Badges of Honour were Michael Cherry (BER); Robert Fekar (SVK); Andrew Finding (GBR); Sadyr Mamytov (KGZ); Fred Sundwall (FIN) and Betty Wates (JAM). Puerto Rico (PUR), 12 November 2015 – Olympic formats were the focus of this afternoon’s session at the FEI General Assembly in San Juan (PUR), with FEI President Ingmar De Vos leading discussions with National Federations on proposed radical changes to Olympic competition formats. “Olympic Agenda 2020 is a driving force in this process, but even prior to that we already knew that changes needed to be made to our formats and the presentation of our sport,” the FEI President said in his opening address. “As the IOC President aptly said at the IOC Session in Monaco last December, ‘to change or to be changed: that is the question’. This is why we are here today: to lead that change. The FEI General Assembly 2015 starts at 09.00 local Puerto Rico time (GMT -4 hours) and will be broadcast live and free on www.feitv.org. Online registration for the FEI Sports Forum 2016 will open at the end of February here: www.fei.org/fei/about-fei/sportsforum. Istanbul (TUR), 8 November 2012 – Lord Sebastian Coe, Chairman of the London Organising Committee of the Olympic and Paralympic Games (LOCOG) has described equestrian as “one of the great Olympic sports”. 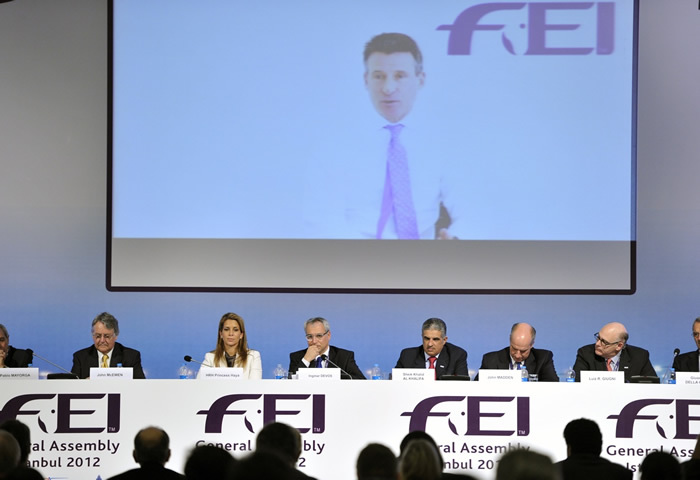 Lord Coe, who was elected as the new chairman of the British Olympic Association yesterday, addressed the FEI General Assembly in Istanbul (TUR) via video link today, congratulating the FEI and its President, HRH Princess Haya, on an “exceptional Olympic equestrian event” at London 2012. “It would be remiss of me not to immediately congratulate the FEI President and all her team for helping us to deliver just an exceptional Olympic equestrian event,” he said. “Our opportunity to bring the sport into the city centre was one that we wanted to grasp with both hands and I want to thank Princess Haya and her Board for helping to do that in such an extraordinarily successful way. Rio de Janeiro (BRA), 11 November 2011 – The Federation Equestre Internationale (FEI) General Assembly opened in Rio de Janeiro (BRA) today with a meeting of the FEI Bureau, the first in four days of meetings culminating in the General Assembly on Monday 14 November. At its meeting today, the Bureau unanimously agreed to a proposal from the Dressage Committee to withdraw the proposed addition to Article 430.7.6: evidence of blood in the arena, in order to allow the Veterinary Committee to study the issue from a horse welfare perspective. The Veterinary Committee has been asked to propose a general rule, in consultation with the various disciplines, that is valid and applicable for all FEI disciplines. This will be discussed at the FEI Sports Forum in April 2012 as part of the Veterinary Regulations revision, for adoption by the General Assembly in 2012 and implementation on 1 January 2013.